For the next installment in the Pyramid System’s All-Time team series, we head to the National League West and a team celebrating its 20th anniversary, the Arizona Diamondbacks. As one would expect with such a new franchise, the D-backs do not have the horses to keep up with the Dodgers, a now-formidable Houston squad, or the Giants. But this team has one of the deepest starting rotations in the league, headlined by perhaps the best starting pitcher in the National League, Randy Johnson. And with emerging stars like Paul Goldschmidt, A.J. Pollock and Patrick Corbin, the Diamondbacks are in a position to make substantial improvements in the not-so-distant future. Here are your all-time Arizona Diamondbacks, as determined by the Pyramid Rating System. Torey Lovullo may have something to say about this if the current Diamondbacks can repeat their 2017 success or better it a few more times, but for now Bob Brenly remains a relatively easy call to manage this all-time team. He is the only manager to lead them to a World Series title, and the only manager in team history to lead the club into the postseason on more than one occasion. Brenley, the current broadcaster of the Diamondbacks, was, in my opinion, the victim of one of the most unjustified firings in recent memory. The Snakes are far from the best team in this league, but regardless of who they are up against, whenever Randy Johnson is on the mound, they have a chance at winning. Among all National League starters, Johnson is rated the highest by the Pyramid Rating System. One look at his peak dominance period of 1999-2002 should be enough to see why. In his first year in Arizona, Johnson went 17-9. His win-loss record would improve every year after that that until peaking at 24-5 in 2002. In three of the seasons (’99, ’01 and ’02) Johnson led the National League in ERA, and he was second in 2000. His 81 wins in that span are the most by any pitcher, as are his 31 complete games (four more than Curt Schilling), 11 shutouts (five more than any other pitcher), and 1,030 innings (111 more than Tom Glavine). As a strikeout pitcher, Johnson is the left-handed version of Nolan Ryan, and with Arizona he was at his most dominant. From 1999 through 2002, Johnson led the NL in strikeouts and in all four seasons it wasn’t even close. Over that four-year stretch, Johnson struck out 1,417 batters. The second highest total was Pedro Martínez with 999. Martinez may be the only pitcher to approach Johnson’s dominance in this stretch, but even his 33.1 wins above replacement is five short of matching Johnson’s 38.1 in this period. Johnson’s eight years with Arizona may seem a bit short, but, relative to hitters, there are few pitchers with lengthy tenures with any one team. Tom Seaver pitched 12 years for the Mets. Steve Carlton had 15 years with the Phillies but was already an established star with the Cardinals before joining them, years for which he does not get credit for purposes of this league. Greg Maddux had just 11 years with the Braves. If any of these pitchers had pitched longer with a single team team, it might have been enough to push them past Johnson, and if this were played out, someone like Bob Gibson could come home with the Cy Young award. Or even Christy Mathewson, or one of the pitchers mentioned above, or even someone active like Clayton Kershaw, who even at a reduced skill level can only add to his legacy as this system sees it. But this system is all about dialing in on peak dominance, and at his best Johnson was as good as if not better than any pitcher with the possible exception of Lefty Grove, the greatest left-handed starter in major league history. Not long ago this would have been Luis Gonzalez, but the last two seasons have been enough to put Goldschmidt ahead of him as the best position player in D-backs history. Since he first led the National League in OPS in 2013, Goldschmidt has established himself as one of the best first basemen in the majors. In what could be a golden age of National League first basemen, Goldschmidt’s name stands solidly alongside those of Anthony Rizzo, Freddie Freeman and Joey Votto. For his part, Goldschmidt seems to be very much on Votto’s pace, consistently finishing in the top 10 in OBP and walks; he had back to back 100-plus walk seasons in 2015 and 2016. He’s also shown plenty of gap power, hitting no fewer than 34 doubles each year since 2012 and three times hitting 30 or more homers in a season, including a league-leading 36 in 2013. 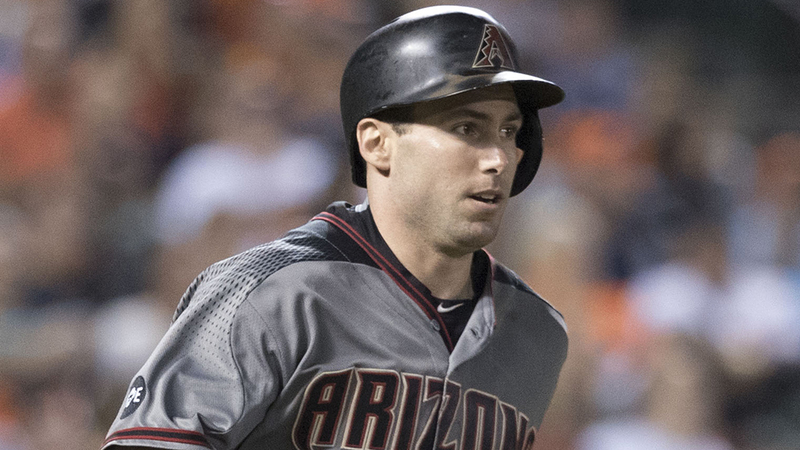 Like Votto, Goldschmidt has proven himself defensively, already possessing three Gold Gloves. In this league, Goldschmidt remains a slightly below-average option at first base, but this has the potential to change within a few years. He’s not at Jeff Bagwell’s level, but I would put him ahead of Steve Garvey and probably on par with Lance Berkman. Again, this evaluation is not to put down Goldschmidt, but to highlight that every team has a Hall of Fame-caliber first baseman. Another couple of years like his past five, and Cooperstown will be a more prominent part of the discussion. The loss of Zack Greinke isn’t a significant one for Arizona, as he would be only the No. 5 starter in this rotation. But Greinke is one of many pitchers (David Cone, Kevin Brown, Bert Blyleven, Gaylord Perry) who don’t get the kind of credit they deserve in this league because they spread great seasons over many different teams . As I’ve mentioned in other installments, no players in history have been rated more unfairly than the modern-day starter. We have Mike Mussina and Curt Schilling, whose absence from the Hall I don’t understand. Kevin Brown, David Cone, Bret Saberhagen and Johan Santana, who I think have substantial arguments for the Hall, have been cast aside after one year. Others, like Kevin Appier and Frank Viola, I think have a better case than given credit for. I have a feeling that Greinke is going to fall into this category. He has moved around quite a bit, in keeping with the typically nomadic tradition of “hired gun” starters, but more often than not Greinke has been worth every penny. As he did with Kansas City and Los Angeles, he has left a lasting impression on Arizona, finishing fourth in last year’s Cy Young balloting as the ace of the team with the second-best ERA in the National League. Greinke’s legacy is still being written, but I hope Arizona gets to enjoy what has been one of the greatest pitchers in baseball over the last 15 years. Without question, this team is built around starting pitching. Johnson is capable of shutting down any offense in the league, and it doesn’t get much easier after him. The No. 2 starter, Brandon Webb, may be the best player in major league history ineligible for the Hall of Fame due to lack of service time. Between 2003 and 2008, no National League pitcher compiled more WAR than Webb. From 2006 through 2008, he finished no lower than second in Cy Young voting and for a time was the most dominant pitcher in the league. A right shoulder injury ended what could have been a Hall of Fame career, but Arizona gets the full weight of his success. Like Greinke, Schilling does not get the full credit for how great he was. Although he pitched more than double the innings with the Phillies than he did for the D-backs, it was with Arizona that Schilling’s reputation went from inconsistent No. 1 starter to the best right-handed pitcher in the National League. In 2001-’02, he was 45-13 with a 3.10 ERA in 516 innings pitched, finishing second in the Cy Young voting in both seasons to teammate Johnson. Together these two presented arguably the greatest one-two combo in baseball history, with each all-time great being at his career best. No other one-two starter combo has ever finished one-two in Cy Young voting, let alone two straight seasons. Johnson and Schilling almost single-handedly pitched the Diamondbacks past the Yankees in the 2001 World Series (they were named co-World Series MVPs), and the D-backs followed up their victory with a 98-win season in 2002. In this all-time league, these two and Webb give them a front three on par with any team. 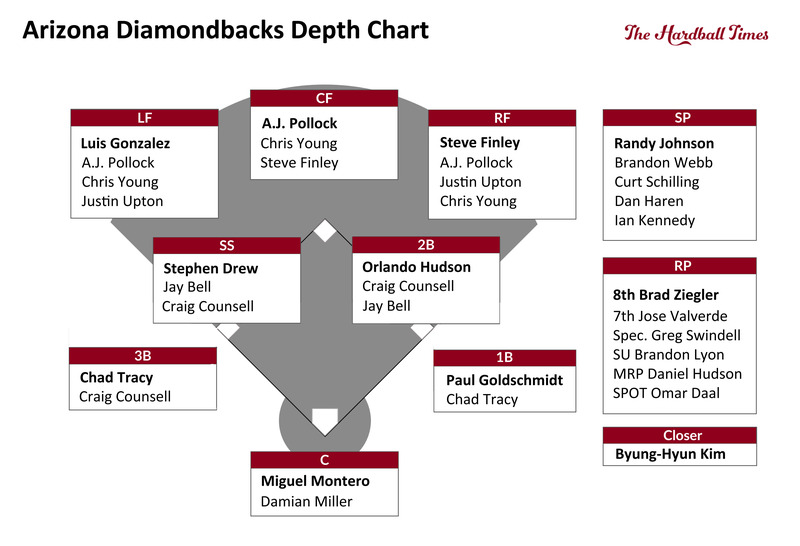 The heavy platoon structure of this team is a happy accident that allows the Diamondbacks to get the most out of one of the worst lineups in the league. In the outfield, the Diamondbacks have decent depth, and the versatility of infielders Jay Bell, Craig Counsell and Chad Tracy allows the team to carry five outfielders, all of whom should expect to see a good amount of action. Luis Gonzalez and the emerging A.J. Pollock present the backbone for a decent outfield, while Steve Finley and lefty-basher Chris Young trade off an effective platoon between center and right. While Justin Upton is left out of the starting lineup, his listing at DH should be a sign of how valuable he’d be coming off the bench whether a lefty or a righty is on the mound. Had he stayed with Arizona longer, Upton would be in this starting lineup, but his tenure in Arizona may be remembered through some rose-colored glasses. Although reliable, he had just one standout season — 2011 — with the D-backs. The Justin Upton who now is putting himself into dark horse Hall of Fame discussion territory has been firmly established only over the past three seasons. Aside from Goldschmidt, this is the worst infield in this all-time league. A few teams, such as Houston, have present-day infields that may be better than this one. As nice a player and person Craig Counsell was, he is not who you want at the plate in a league like this one, though on defense, he may be one of the all-time underrated players. Four times with the Diamondbacks, Counsell finished in the top 10 in defensive WAR, but his constant shifting among infield positions meant any Gold Glove ideas were an afterthought. The depth is not much better, with the likes of Kelly Johnson making a 40-man roster in a league where Hall of Famers can’t make 40-man squads on some teams. Even including fan favorite Matt Williams on this team wouldn’t lead to much improvement; aside from his 1999 season, Williams did not have a single season with an OPS+ over 100. While not a disaster, Arizona’s bullpen leaves much to be desired. It does not match up against the likes of Houston or Los Angeles and lacks the depth to make up for any injuries to Byung-Hyun Kim or Jose Valverde. The Diamondbacks will likely need to lean heavily on their starters to have a chance. With Johnson on the mound, this likely won’t be much of an issue, but it would be more so with Ian Kennedy. Expect a lot of low-scoring games in the desert. The Diamondbacks would be competing the with Marlins and Padres to avoid having the worst offense in the National League. But as long as Johnson, Webb or Schilling is on the mound, the Snakes will have a chance against any opponent. Their front three alone will be enough to prevent them from being the worst team in the league. They don’t pose any real threat to Houston, Los Angeles or San Francisco, all of which will be able to match Arizona’s starting pitching and bullpen depth. But I would put them well ahead of Colorado and San Diego, and they could finish as high as .500. The emergence of Goldschmidt as one of the game’s best players gives Arizona its first chance to get an All-Star caliber hitter in this league, while Pollock will likely continue to establish himself as a cornerstone along with the team’s second-best position player, Luis Gonzalez. If the Diamondbacks are ever to compete at a higher level, they will need to make some serious improvements to their infield. Those, unfortunately, do not seem imminent. As long as that remains, the D-backs will be capable of giving any opponent problems, but not be a serious title contender. For those who have been following along and would like to learn more about the Pyramid Rating System, I have made available the database which includes how every season has been evaluated in MLB history. It’s still a work in progress, but this is what I have been working on these last few months for anyone wondering why I haven’t put out more of these articles. Maybe I misunderstood the rules of this exercise, but there are several players on the “Expanded Rosters” who have played for more than one team (e.g. Inciarte, Segura, etc. ).